As he stands as one of, if not the most important organists in mid-17th century Germany, it is natural that the keyboard music of Dieterich Buxtehude (1637/9-1707) is still often performed today. While his vocal works haven't received the same kind of attention by modern musicians, over the past twenty years there has been a a rediscovery of many excellent, moving examples within his output. This weekend Accademia Barocca Lucernensis will perform one of Buxtehude's cantata cycles, Mebra Jesu nostri patientis sanctissima (or, The most holy limbs of our suffering Jesus). The cycle combines liturgical text with a medieval devotional poem, the Oratio rhythmica. It is organised into seven cantatas, following the structure of the poem, each being addressed to different parts of Christ's crucified body: feet (Ad pedes), knees (Ad genua), hands (Ad manus), sides (Ad latus), breast (Ad pectus), heart (Ad cor), and head (Ad faciem). The work, composed in 1680, has been described as the first Lutheran Oratorio. While six of the seven cantatas require relatively small forces (five voices, two violins, and continuo), the sixth requires the singers to be accompanied by a consort of five viole da gamba and continuo. When listened to in sequence, the change of instrumentation for the cantata Ad cor can have quite an effect. The switch violins to a consort of gambas gives the impression of a change of perspective. While the cantata is relatively short, for a moment the cycle gains an element of introspection. It's a kind of effect which is most compelling if witnessed in person, as there is a visual element to the experience. 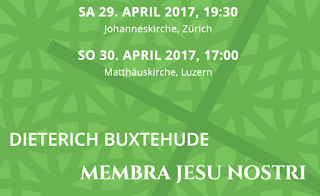 Performances on Saturday, April 29, at 19:30 in the Johanneskirche, Zurich; and on Sunday. 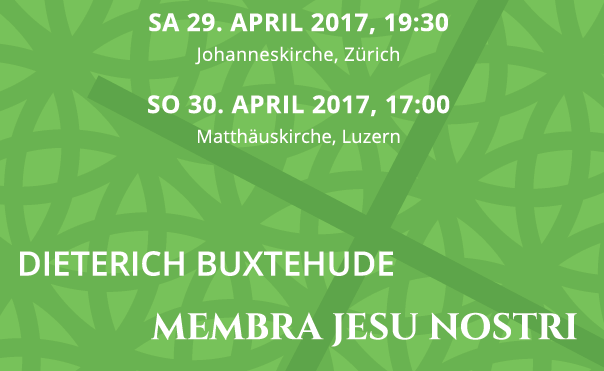 April 30, at 17:00 in the Matthaeuskirche, Luzern.